Used Einstein Bagels Display Coolers Now Available!!! One Fat Frog Restaurant Equipment just got in some very nice used Structural Concepts curved glass display coolers – the same kind you see in Einstein Bagels! These are really high quality used Structural Concepts display coolers and you know if they’re the same ones that they utilize in Einstein Bagels that these used Structural Concepts curved glass display coolers are true workhorses and very reliable. These used Structural Concepts curved glass display coolers that they use at Einstein Bagels are the perfect addition to any convenience store, bakery, deli, diner, cupcake shop, cafe, etc. And now you can bring home this used Structural Concepts curved glass display cooler from One Fat Frog Restaurant Equipment home to your location without breaking the bank or dipping into little Susie’s college fund. Why would you do that to little Susie?!?! 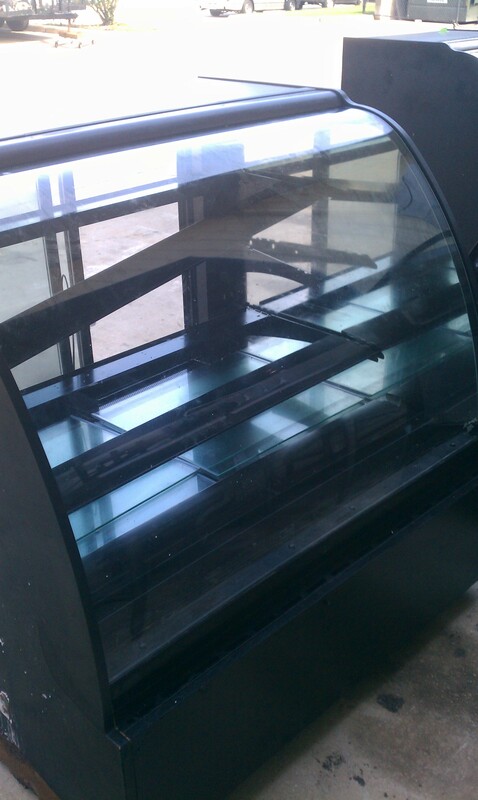 Curved glass display coolers are hot items and never last long at the One Fat Frog Restaurant Equipment warehouse, so if you’re interested in this used Structural Concepts curved glass display cooler that they use at Einstein Bagels, then act fast before it’s gone baby, gone! One Fat Frog Restaurant Equipment will even give this used Structural Concepts curved glass display cooler that they use at Einstein Bagels a complimentary paint job at purchase! One Fat Frog Restaurant Equipment will supply the black, white, or silver paint, but if you want your used Structural Concepts curved glass display cooler that they use at Einstein Bagels any other color, simply bring the paint of your choice into One Fat Frog Restaurant Equipment and the One Fat Frog Restaurant Equipment painting wizards will take care of the rest. Use your imagination! Get your used Structural Concepts curved glass display cooler that they use at Einstein Bagels painted to match your location! Or go nuts and get a leopard print used Structural Concepts curved lass display cooler that they use at Einstein Bagels! One Fat Frog Restaurant Equipment also offers free delivery to nearly the entire state of Florida! You can get your used Structural Concepts curved glass display cooler that they use at Einstein Bagels delivered to your location absolutely free! One Fat Frog Restaurant Equipment delivers absolutely free to Orlando, Sanford, Lake Mary, Jacksonville, Ocala, Gainesville, Tampa, the Beaches, North Central Florida, and more! Additional delivery dates and cities are being added all the time – call for more details on how you can get your used Structural Concepts curved glass display cooler that they use at Einstein Begales delivered absolutely free! One Fat Frog Restaurant Equipment doesn’t stop at free paint jobs and free delivery. One Fat Frog Restaurant Equipment also offers free gas conversion from liquid propane to natural gas and vice versa and free custom cutting boards for used prep tables sold by One Fat Frog Restaurant Equipment. Sure these offers don’t apply to this used Structural Concepts curved glass display cooler that they use at Einstein Bagels, but it’s good to know for any other pieces of used commercial restaurant equipment you may purchase from One Fat Frog Restaurant Equipment! One Fat Frog Restaurant Equipment also welcomes quick cash deals and package deals towards the entire stock of used commercial restaurant equipment – including this used Structural Concepts curved glass display cooler that they use at Einstein Bagels. By now I’m sure I’ve convinced you to get this used Structural Concepts curved glass display cooler that they use at Einstein Bagels from One Fat Frog Restaurant Equipment! Act fast!